Service Saddles provide a quick, dependable means of tapping pipe for branch connections, 1/2" through 2-1/2". Use of economical JCM Service Saddles eliminates problems common to direct taps, such as leaking threads, or split pipe; and the saddle reinforces the critical connection. High pressure performance is assured by the broad, pressure activated gasket. Permanently set in a retaining cavity, the contoured gasket produces a positive initial seal, which improves with an increase in line pressure. Service Saddles provide a quick, dependable means of tapping pipe for branch connections, 1/2" through 2-1/2". Use of economical JCM Service Saddles eliminates problems common to direct taps, such as leaking threads, or split pipe; and the saddle reinforces the critical connection. High pressure performance is assured by the broad, pressure activated gasket. Permanently set in a retaining cavity, the contoured gasket produces a positive initial seal, which improves with an increase in line pressure. These service saddles are designed for maximum safety and performance. The wrap-around design, wide skirt, and wide straps, support and reinforce the pipe while providing excellent stability to the saddle. The heavy duty design of these saddles provides strength and mass for long term service. Body: Ductile Iron ASTM A536 Straps: Models 401, 402 - Electro Galvanized Steel; Models 403, 404, 405, 402 - Bands, Bolts, Nuts and Washers are 18-8 Type 304 Stainless Steel. Gasket: Compounded for use with water, salt solutions, mild acids, bases. Finish: Models 401, 402, 403, 404 - Standard Shop Coat Primer: Heavy coat of corrosion resistant metal primer. Models 405, 402 - Fusion Plastic Coating: fusion bonded, high density blue plastic coating, 12 mils minimum thickness with a dielectric strength of over 12,000 volts. The 402 Double Strap Service Saddle provides a simple, dependable means of tapping all types of pipe for branch connections, 1/2" through 2-1/2". With its wide body, large sealed outlet area, and heavy duty wrap around design, the 402 is also an excellent way to repair holes, pin holes, and leaking. ? ?The saddle is also exceptionally effective when making 3/4" and 1" direct taps. Saddles, for pipe sizes 14" through 24", incorporate two fabricated wide electro-galvanized steel straps, which provide increased stability necessary for larger sizes of pipe. Service Saddles are constructed with ductile iron and shop primer coating, and have corrosion resistant AISI C-1018 steel, zinc plated with dichromate seal. 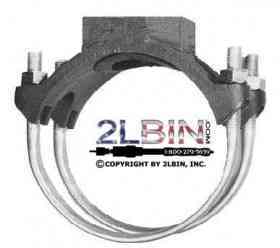 These saddles meet or exceed AWWA C-800 Standards for service line fittings. The gasket shall be permanently bonded into a cavity in the saddle body, which provides internal, as well as external, gasket retention. Service saddles shall be 402 or an approved equivalent. The Service saddles, for pipe sizes 14" through 24", shall have two, 2-1/2" wide, fabricated zinc plated steel straps, in lieu of the forged steel straps, to provide increased stability on service taps, increased corrosion resistance, and increased strength for added safety on these larger sizes of pipe. 400 Series Service Saddles are ANSI/NSF Standard 61 Certified. Service Saddles are constructed of ductile iron with shop primer coating and have corrosion resistant AISI C-1018 steel, zinc plated with dichromate seal. 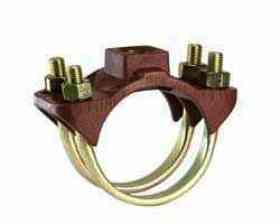 These saddles meet or exceed AWWA C-800 Standards for service line fittings. GASKET: Molded virgin rubber with a pressure activated hydro mechanical design. Gasket is bonded into a cavity for internal and external retention. Gasket is suitable for water salt solutions, mild acids, bases, and sewage. BODY CASTING: Wrap around design of Ductile Iron ASTM A-536. Body has a gasket cavity, which provides internal as well as external gasket retention. STRAPS: Nominal sizes 2" through 12" have corrosion resistant, forged AISI C-1018 steel straps, zinc plated with dichromate seal. Nominal sizes 14" through 24" have two (2) 2-1/2" wide fabricated zinc plated steel straps for additional stability and strength. COATING: Casting is coated with shop primer coating. PRESSURE RATING: Working pressure is 250 PSI hydrostatic. Contact factory if higher working pressure is required. Check pipe surface for irregularities. Mount saddle body in proper position on pipe. Check to make certain gasket is in proper position and not in waterway. NOTE: Sizes 15.20 and larger utilize two (2) wide straps in lieu of the forged strap. 408 Coated Double Strap Service Saddle with electro galvanized straps available, contact the Inside Sales Team.